Beautifully updated executive home in River Walk, one of Oviedoâs premier GATED communities. 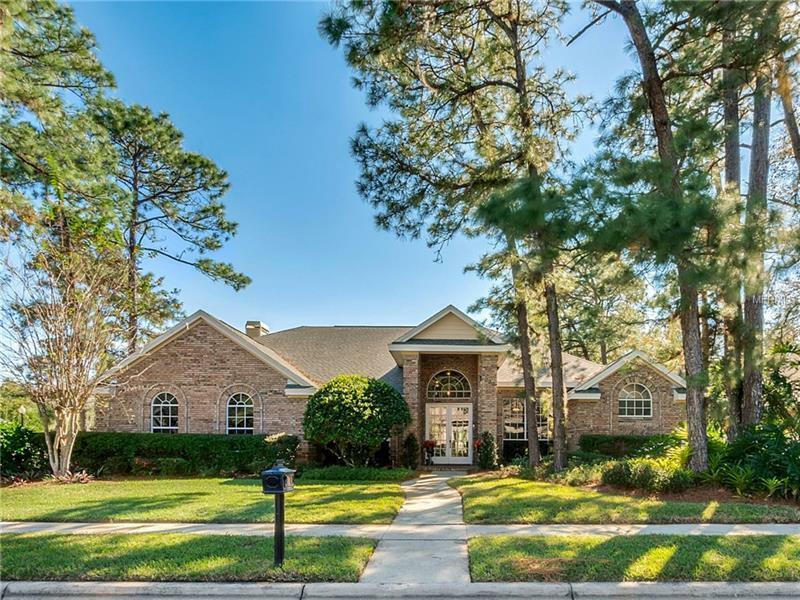 The BRICK FRONT home is sited on an over 1/3 acre corner lot, nestled among mature live oak and pine trees. This meticulously maintained property truly has it all, 4 bedrooms, three full baths plus a home office, along with both formal and informal living spaces. The home is light and bright with plenty of windows and soaring 14â ceilings. The kitchen has been recently updated with 42â solid wood cabinets, silestoneÂ® countertops, wall oven and island cooktop. The family room, kitchen combination is perfect for entertaining, featuring a wood burning fireplace. Both the formal living room and family room open onto the huge covered lanai that features an outdoor kitchen and NEWLY RE-SCREENED pool area. The pool features a PEBBLE TECH finish. The FENCED backyard is tastefully landscaped and has plenty of room for pets and a playset. The master bedroom features wood tile flooring and newly remodeled master bath with custom cabinetry, seamless glass shower enclosure with rain shower head, double sinks and stone counters. The SIDE LOAD two car garage enhances the homeâs curb appeal. NEW ROOF (2018), NEW SKYLIGHTS (2018), NEW A/C (2018), RADIANT BARRIER, PLANTATION SHUTTERS throughout, RING DOORBELL, SECURITY SYSTEM and ALL APPLIANCES included. Donât hesitate, see this home today! Pet Restrictions: See HOA docs for any pet restrictions.